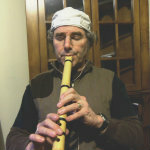 ESS Shakuhachi Forum :: The Year of The Dragon! The Year of The Dragon! Posted: 2012-01-22, 22:18 Post subject: The Year of The Dragon! This is a doodle I did with colored pencils and ink, a couple of months back. It started out as a Laughing Buddha playing shakuhachi under the full moon, which is why the belly is so round and quite bulging. But some doodles have a mind of their own, eh? May we all play like dragons this year of 2012... and all blow fiery Ro. Posted: 2012-01-23, 14:46 Post subject: The Year of The Dragon! Happy New Year to you too! Nice artwork Jon! Posted: 2012-01-26, 02:00 Post subject: The Year of The Dragon! Posted: Today at 13:41 Post subject: The Year of The Dragon!